For David Pugh, a degree in mechanical engineering was a big step toward achieving his goal of a career in the marine industry, but as he evaluated his options after graduating, he identified a missing element. "The idea of combining the analytical aspects of engineering with the aesthetic elements of product design was very appealing to me," recalls Pugh, "and led me to broaden my education with additional coursework in yacht design." A search through consumer boating magazines led him to the Westlawn Institute of Marine Technology, an institution of distance education headquartered in Stamford, Conn. Pugh then contacted a number of marine designers and engineers for their opinions on the value of a Westlawn education; their favorable comments convinced him to sign on for the school's Yacht Design Course. The Westlawn study program, Pugh confirms, was challenging. "Completing a course of study at home takes discipline and hard work," says Pugh, "and admittedly I was a little apprehensive about the ultimate value of long-distance learning." His concerns were quickly laid to rest. "The course content was very engaging and stimulating," Pugh says. "Text materials presented the subject matter in a logical, understandable sequence, and the instructors were accessible and responsive to questions that came up while I was completing assignments, so the learning was consistent and rewarding." At a pace of 15 to 20 hours each week, Pugh's coursework spanned two years. 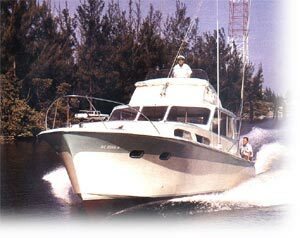 "By 1995 I was well into the fourth and final module when I learned through the Westlawn administration that Bayliner Marine Corporation was looking for a development engineer, Pugh recalls. "I applied for the job and was hired prior to completing the Westlawn course." Today, as a senior development engineer for Maxum Yachts, Pugh credits his Westlawn experience with fulfilling his goal of combining the physical disciplines of engineering with the creative processes of product concept and design. And the learning continues to deliver value to this day. "The Westlawn course was thoroughly grounded in the real world, and has been truly relevant to my work," he says. "I still refer to my Westlawn text material to help resolve a variety of design issues that come up on a daily basis." While I regret having stopped short of completing the Yacht Design Course-the job offer at Bayliner was simply too great an opportunity-I consider my Westlawn experience to be invaluable," says Pugh, "a major factor in enabling me to build my career." Located in Mystic Seaport, Mystic, Connecticut, the Westlawn Institute of Marine Technology offers specialized education to students throughout North America and worldwide. The school, an affiliate of the American Boat & Yacht Council, is approved by the Connecticut Department of Higher Education, and accredited by the Distance Education and Training Council.